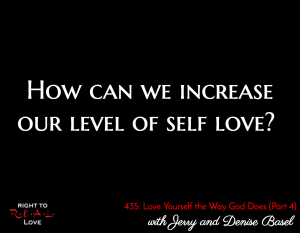 In this episode, Jay concludes his discussion with authors Jerry and Denise Basel by addressing the question: How can we increase our level of self love? How can we determine our current level of self love? How can we increase our level of self love? Signs that we may not love ourselves. The value in acknowledging our feelings during the healing process.